The Director General of IICA met with high-level authorities of the country, during the first leg of a tour in the Eastern Caribbean region, which will include visits to Dominica and Saint Lucia. 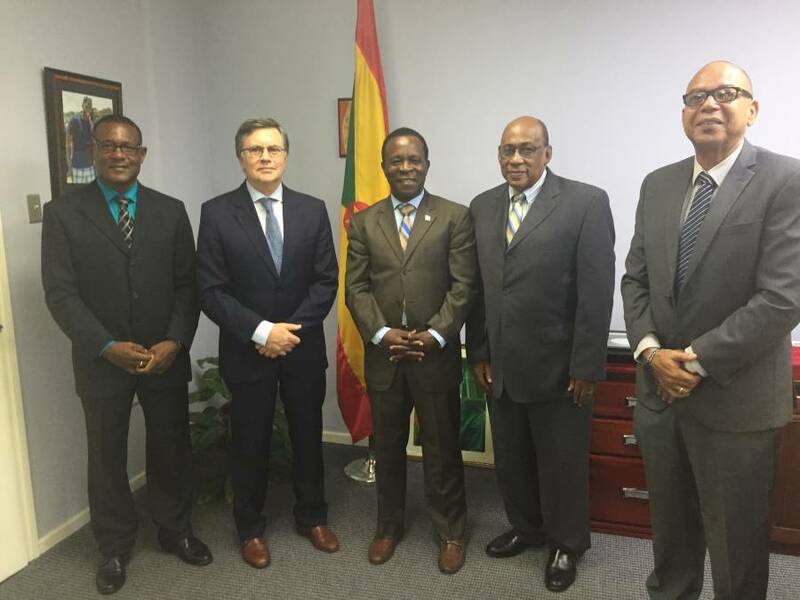 The Director General of the Inter-American Institute for Cooperation on Agriculture (IICA), Manuel Otero, met with the Prime Minister of Grenada, Keith Mitchell, and other high-level authorities of the country, during the first leg of a tour in the Eastern Caribbean region, which will include visits to Dominica and Saint Lucia. The head of IICA, an organisation of the Inter-American System specialising in rural and agricultural development, was also welcomed to Grenada, a member country of the Organisation of Eastern Caribbean States (OECS), by Peter David, Minister of Foreign Affairs and Labour, and Yolande Bain-Horsford, Minister of Agriculture and Lands. During the meetings, Otero expressed IICA’s commitment to assist in efforts to restore this Caribbean country’s primary refrigeration plant, which is publicly owned. He also reiterated the hemispheric agency’s support for initiatives related to health and trade. “This visit strengthens the excellent relationship between Grenada and IICA. I expressed our full support for the rehabilitation of a publicly owned refrigeration plant, in order to correct current structural and managerial issues. Our goal is to transform the plant into a reference centre for the dressing of animals, including large and small ruminants and pigs,” stated Otero. The meetings, according to Otero, also reviewed food safety, health, and trade-related matters, given Grenada’s need to reduce its annual food import bill of approximately $400 million. He maintained that the recent approval of the Institute’s roadmap – the 2018- 2022 Medium-term Plan – will allow the hemispheric body to launch differentiated development strategies for the Eastern Caribbean. He urged authorities there to embrace opportunities for regional complementarity arrangements with countries in the Mercosur bloc, under the framework of South-South cooperation. He also made reference to opportunities that IICA had created, by organising a mission of Ministers of Agriculture of the Caribbean, Brazil and Argentina in March of this year. On Tuesday, IICA’s Director General will travel to Dominica, a country that was particularly hard hit by the hurricane season (northern) in the summer of 2017, where there will be a review of the effectiveness of actions taken by the organisation to reduce the impact of extreme climate events. He explained that the meeting would address climate resilience initiatives to equip the agriculture sector to withstand the challenges created by climate change. In addition to the planned discussions with high-level authorities in the 3 countries, Otero will also meet with representatives of regional organisations, such as the Caribbean Community (CARICOM), the Caribbean Agricultural Research & Development Institute (CARDI) and the OECS. IICA maintains a strong presence in Grenada, Dominica and Saint Lucia and has committed to working in the Caribbean to initiate a differentiated strategy to increase agricultural productivity, focusing on value added and the inclusion of young people and women. The Eastern Caribbean is located in a region with the highest incidence of natural disasters in the world and its annual food import bill is in excess of $1 billion.